I am a very picky eater, so much so that on our honeymoon in Europe, I think I lost weight…LOL. 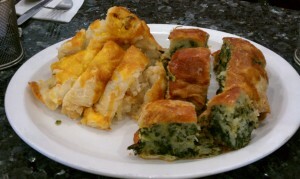 That being said, if I like a certain food item, it must be good. I am always hesitant about trying something new because I would hate to pay for something I don’t like (being that I am frugal and all). 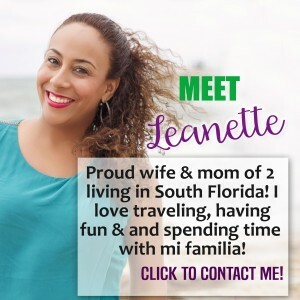 So, when I was invited to a blogger event at Zinger’s Deli, Founded in 2011 in Boca Raton, Fla., I told myself I’d be open to trying new items ans that’s exactly what I did . The new restaurant features an assortment of homemade and high quality foods, such as bread baked daily in-house, homemade soups, knishes and salad platters. 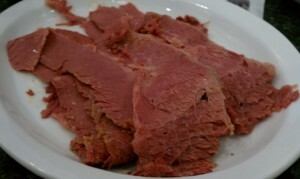 The private-label meats include pastrami, corned beef and brisket. The menu also features unique items such as potato pancake latke tots and a veggie burger made with 20 secret ingredients. Let me me give you a run down of what I was able to sample and then I’ll tell you more about my favorites ones. 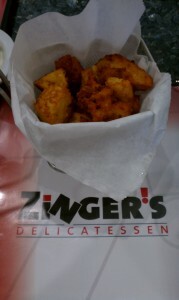 Zinger’s Latke Tots (homemade potato pancakes served in bite size pieces) ….such great taste and texture. 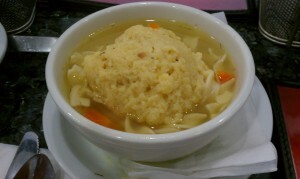 Matzoh Ball Soup (chicken soup with homemade matzoh balls)…I had never had this before and it was delish. 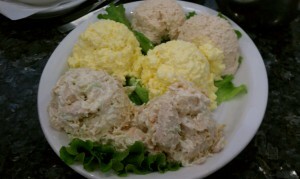 Tuna Salad (solid white)…I just could not get enough of this and I really am not a fan of tuna salad. 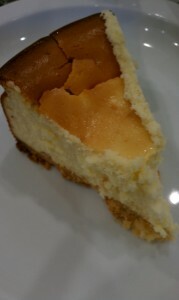 New York Cheesecake (It’s really from New York)….YUMMY! My only regret is that I wasn’t paying attention and I missed the chance to eat their Chocolate Cake (which is my absolute favorite)…it taunted me on my way out. 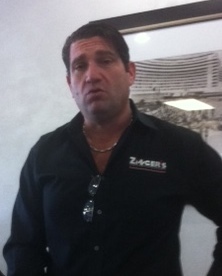 Gary Zinger originally owned Pastrami Queen in the same shopping center, but reopened as Zinger’s. Gary Zinger brings over 15 years of restaurant and deli experience to the new deli. The restaurant features flat screen TVs, a sleek modern feel, and beer and wine makes it an excellent place to catch your favorite sporting events. 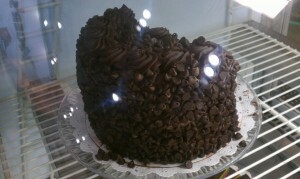 The restaurant also has a quick-takeout counter and big glass cases display the monster-sized chocolate cakes (I can still see it that cake in the display case) and specialty meats. They are open for lunch and dinner Monday through Sunday and serves breakfast Saturday and Sunday. 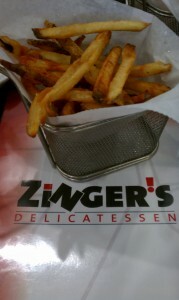 Zinger’s is open from 11 a.m. to 9 p.m. Monday though Friday, and 10 a.m. to 9 p.m. Saturdays and Sundays. 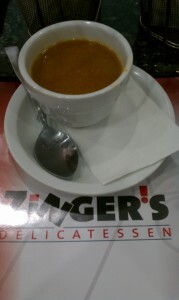 I love the ambiance, the owner, Gary Zinger, is extremely friendly and their food is delicious….so if you are ever in the area stop on by Zinger’s Deli and grab something delicious to eat. 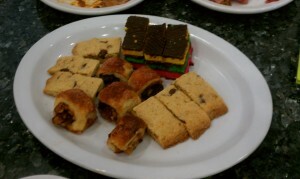 I attended a blogger event where various menu items were provided to sample. No compensation or expectation was given to post about the event. Opinions are 100% my own (I wouldn’t have it any other way). My husband has had gastric bypass & can literally only eat certain foods/portions. He asked to have a small amount of chicken salad as his meal. 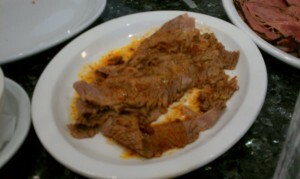 The waitress argued they are not allowed to do that as deli items can’t be in the dining area (odd rule). She offered the platter or sandwich which he can’t eat half of the items, let alone the amount of food. He explained it’s a huge waste of food. The manager then came over & proceeded to argue with my husband that it’s against their policy to have any deli items in the dining room. My husband advised him of his issue & he refused to accommodate at all. So my husband left. We had a full table & he felt it was worth losing customers over this. We even offered to pay separately at the deli counter then have him rejoin the table. The manager said he’d be asked to leave. We have always liked this place before but, now will never return. I’m going to be sure to let everyone I know in Boca to NOT come here.